Accueil Produits Bande originale La bande originale de “Cendrillon” (Film – 2015). Sortie : 10 mars 2015. 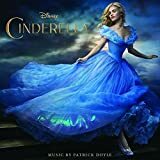 Film : Cendrillon (Film – 2015). 1. A Golden Childhood – 3:56. 2. The Great Secret – 3:01. 3. A New Family – 2:15. 4. Life And Laughter – 1:34. 5. The First Branch – 2:11. 6. Nice And Airy – 1:53. 8. The Stag – 4:56. 9. Rich Beyond Reason – 1:43. 10. Fairy Godmother – 2:47. 11. Pumpkins And Mice – 4:32. 12. You Shall Go – 3:02. 13. Valse Royale – 2:06. 14. Who Is She – 3:20. 15. La Valse De L’amour – 2:34. 16. La Valse Champagne – 1:35. 17. La Polka Militaire – 1:47. 18. La Polka De Paris – 1:22. 19. A Secret Garden – 2:48. 20. La Polka De Minuit – 2:02. 21. Choose That One – 1:16. 22. Pumpkin Pursuit – 2:28. 23. The Slipper – 1:00. 24. Shattered Dreams – 4:10. 25. Searching The Kingdom – 2:51. 26. Ella And Kit – 2:11. 27. Courage And Kindness – 4:38. 28. Strong – Sonna Rele – 3:14. 29. A Dream Is A Wish Your Heart Makes (par Lily James) – 2:00. 30. Bibbidi-Bobbidi-Boo (The Magic Song) (par Helena Bonham Carter) – 1:22.